For more than 50 years wild Indo-Pacific bottlenose dolphins have visited the shallows at Monkey Mia. This encounter is one of the world’s great wildlife experiences and attracts more than 100,000 visitors a year. Today dolphins are only fed according to strict guidelines and under supervision of Parks and Wildlife Service officers to ensure the dolphins continue to hunt and behave naturally. Outside this experience it is illegal to approach within 30 metres of a dolphin in the water. If you are fortunate to have a dolphin approach you, please remain still and enjoy the experience without touching it. 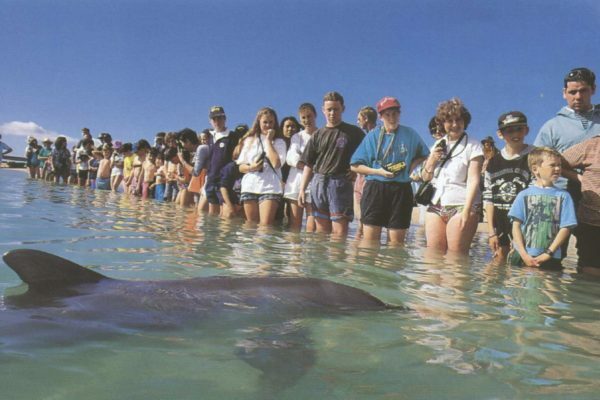 Times for the dolphin experiences depend on if and when the dolphins visit the beach. While they are only offered fish during their first three visits between 7:45 am and 12 noon, they often visit the beach outside these times. Only a select group of five mature females are offered fish. If they visit more than three times or after 12 noon they will not be fed. It is best to arrive early as dolphin experiences may finish well before noon. Although rare, there are days when the dolphins do not visit the beach. 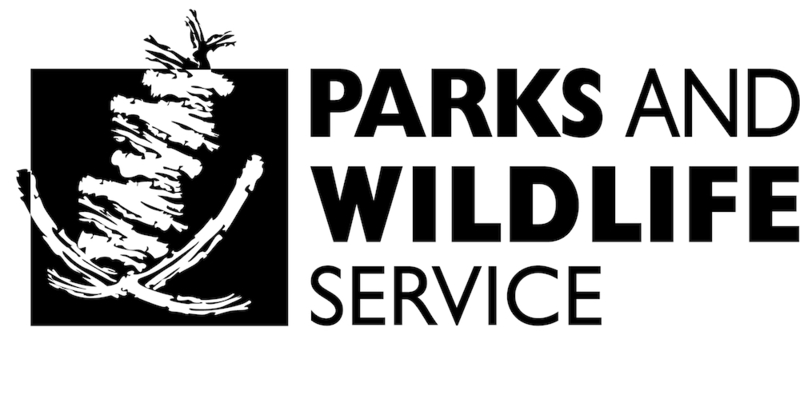 Please meet the rangers on the boardwalk for a briefing at 7:45am. Remain on the boardwalk until rangers invite you onto the beach. If you are chosen to feed a dolphin, please do not touch the dolphin. For the well-being of the dolphins, please follow instructions at all times. 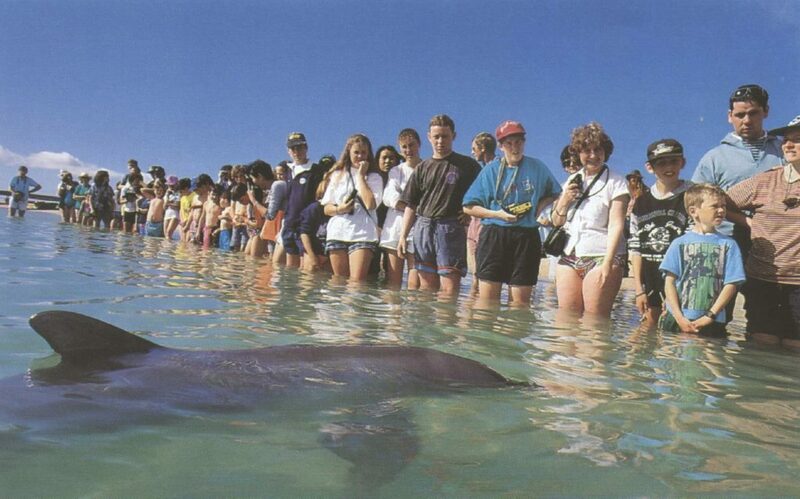 Instructions and regulations for dolphin experiences are based on research done at Monkey Mia. Researchers have been studying dolphin behaviour, ecology, genetics, development, communication, social structure, predators and prey. Find out more about this research at Dolphins of Monkey Mia Research Foundation. The Monkey Mia Recreation Zone extends in an 800 metre radius around the end of the Monkey Mia jetty. The dolphin experience area is within that zone and is the only place where dolphins are fed. Boating, swimming and fishing are prohibited in the dolphin experience area. This allows the dolphins to visit without disturbance and enables and Parks and Wildlife Service rangers to monitor the dolphins’ health. Spearfishing, netting, water skiing and jet skiing are prohibited in the Monkey Mia Recreation Zone for the safety and well-being of the dolphins. Line fishing is not permitted in the dolphin experience area but is allowed in other parts of the recreation zone. Dolphins that spend considerable time and energy avoiding boats may leave their preferred hunting, breeding and resting places.